Here is a link to previous Interludes in our walk though history with Mr. Horne. Millions of books would be accumulated, along with a stunning amount of other cultural and religious items collected from across Europe. Farmer writes of being introduced to Offenbach by “his boss” Captain James Rorimer in the fall of 1945. “He took me with him to inspect an abandoned warehouse within the I.G. Farben plant at Offenbach,” remembers Farmer. 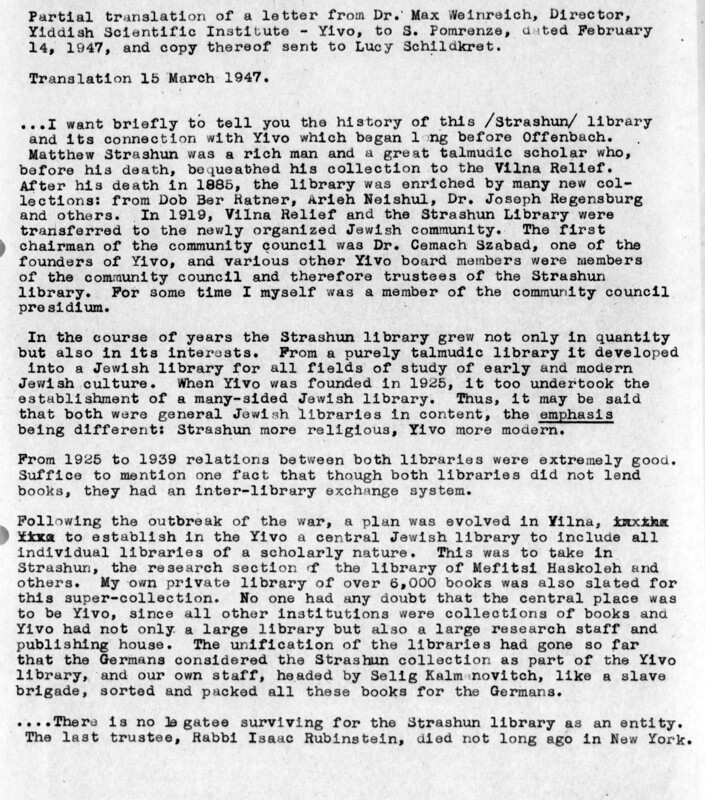 “This building was under consideration to become to repository primarily for Jewish libraries, archives and the Torahs.” Prior to the warehouse in Offenbach being established as a collecting point, library collections were being stored at the Rothschild Library in Frankfurt. Over time it was clear that infrastructure at the Rothschild Library was inadequate. Based on his and others assessment of the situation, librarian and MFA&A officer Lt. Leslie Poste suggested that detailed cataloging of the items be stopped at Rothschild and that operations be relocated across the river to the I.G. Farben plant, the site of a five-story, reinforced concrete loft building. Pomrenze put into place necessary administrative, transportation, cataloging and storage systems enabling the depot to operate much more effectively. Professional conservation and preservation labs, a photographic studio and other needed infrastructure was created. His successor, Captain Isaac Bencowitz, refined a system for photographing ex-libris and library markings found in books. As requests were submitted by individuals, families and nation states seeking missing items, MFA&A staff were able to use the catalogs to help them search through the millions of books and cultural items that would eventually be stored at Offenbach. Bencowitz, during his tenure as director, used photography to document the operations of the depot and its staff and volunteers. Staffing the depot was a mix of U.S. military, Allied and civilian personnel, as well as German civilians, and scholars from around the world. 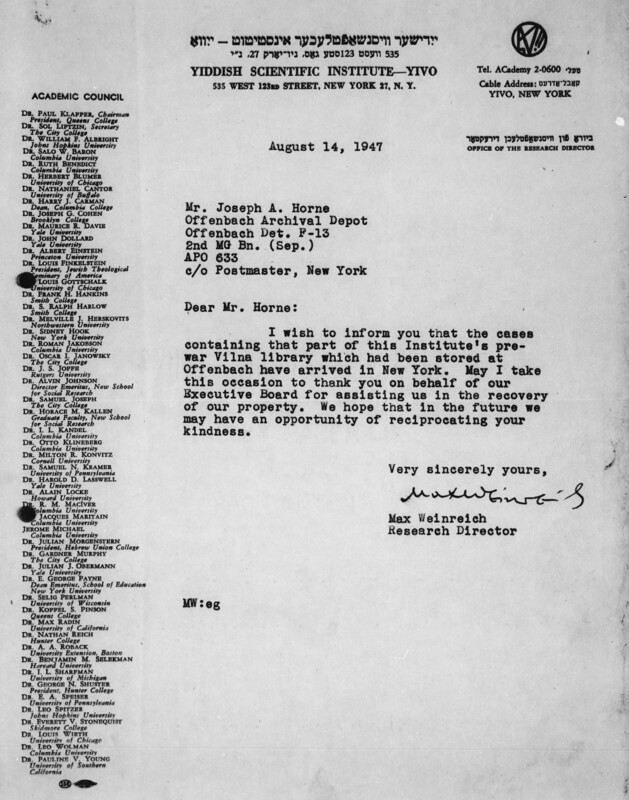 In October 1946, Bencowitz received orders for redeployment. The imminent nature of his departure and shifting priorities in the region for policy and decision-making made selecting a new director difficult. As an “emergency measure,” archivist Major Lester K. Born and his assistant, Joseph A. Horne, were sent to Offenbach for temporary duty. 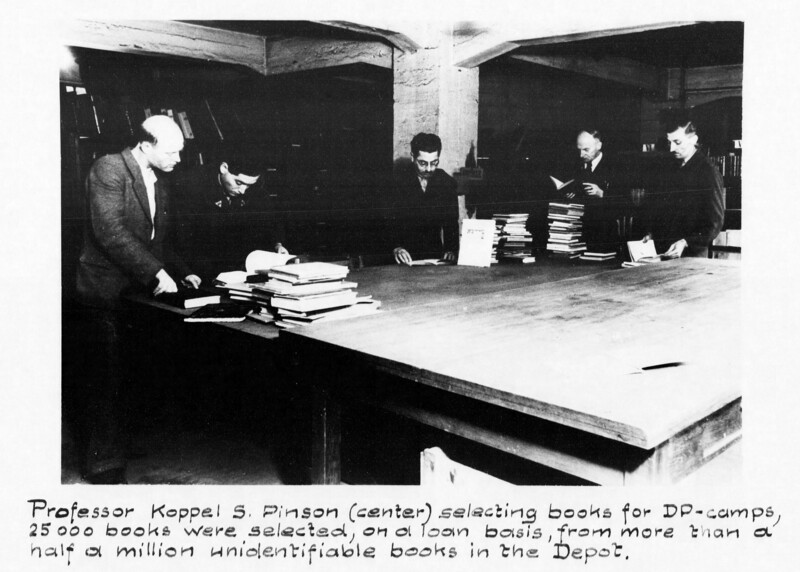 Born was to develop an interim plan for continued operation of the depot, a plan that Mr. Horne was to implement. 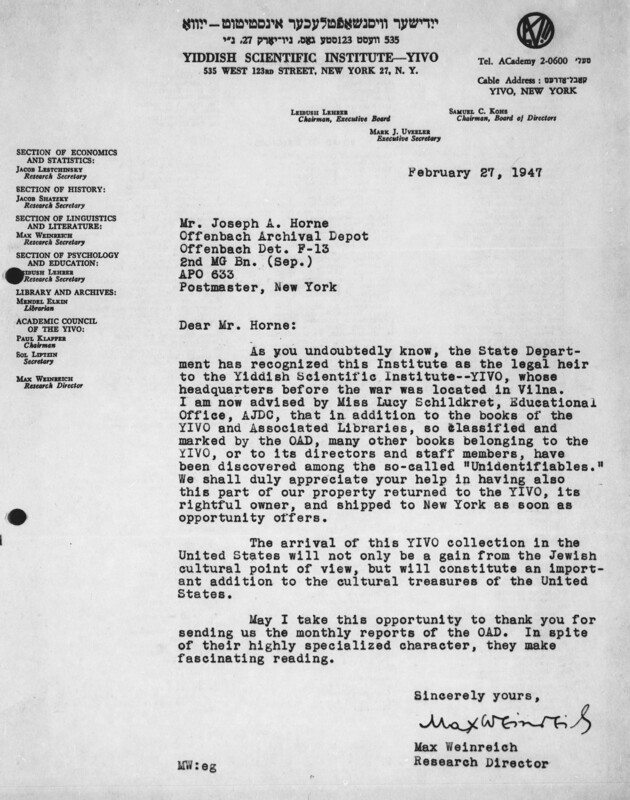 In short, a plan was finally developed and by January 1947, Horne became the third director of the Offenbach Archival Depot. By 1947, relations with the Russians had deteriorated significantly, adversely affecting the restitution of items to individuals and institutions in Russian-controlled territories, and the exchange of items between the Russian Zone and other Allied Zones. With plans well underway to revitalize German economy and culture (including denazification), military and intelligence priorities shifted to stopping the Russians. And so Horne like many within the MFA&A unit followed orders as high level officials made clear that those in the U.S. intelligence sector had full access to depot materials and freedom to act as they deemed necessary. In her memoir, From That Place and Time, Lucy Schildkret describes her encounter with Horne as she works to sort, identify and return the YIVO library of Vilna, Poland. The Yiddish Scientific Institute (YIVO) was founded in 1925 for the scientific study of Jewish life. Headquartered in Vilna, the institute had branches around the world including the United States. At the start of the war its headquarters were transferred to New York City. 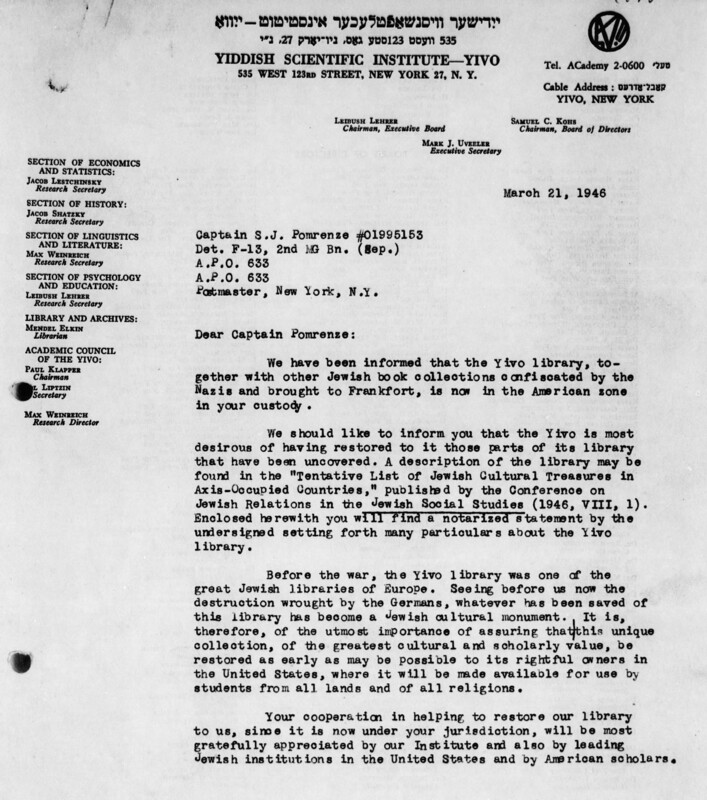 In late 1945, when the YIVO library was identified as being in Frankfurt, visiting Jewish scholar, Prof. Koppel S. Pinson sought permission from the YIVO leadership in New York to distribute, like a lending library, some of the unidentifiable books to Jews living in the Displacement Camps. It would take time but he would be granted such authority. A year later, Lucy Schildkret would also be granted authority to work with the books. The complexities of sorting, identifying and returning books at the scale demanded of the Offenbach Archival Depot become clearer when reading through the declassified documents relating to what happened with just the YIVO library. For instance, YIVO like many libraries of its size and mission had been the repository of family libraries. Books at Offenbach were being identified by ex-libris and other markings as belonging to individuals and/or their families but they had in fact been donated to YIVO (or other institutions) by family members. There are numerous letters between YIVO administrators with U.S. military officials trying to prove the ownership of items. 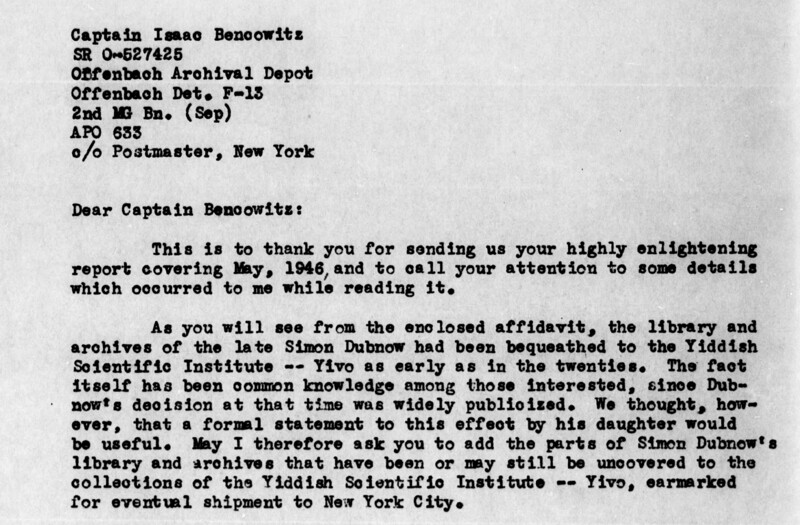 Though correspondence about the YIVO library begins in 1945, by early 1947 the vast library had yet to be shipped to YIVO in New York. The reasons include continual reduction in manpower, both skilled and unskilled, at the depot and complex, bureaucratic chains of command within the U.S. military, between the Allied zones and even within the YIVO organization. 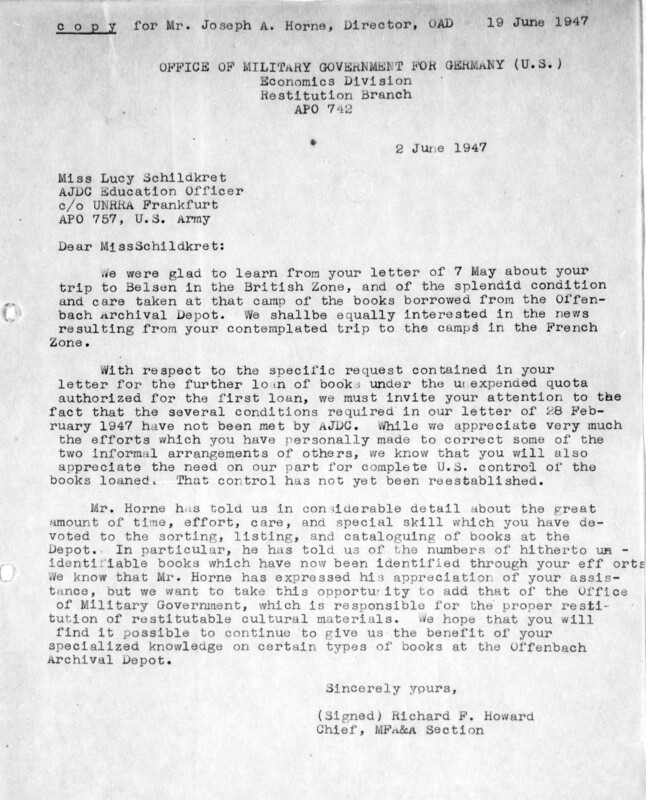 In a March 1947 document, Horne reports to his superiors that Miss Schildkret has been unable to examine several hundred thousand unidentified books because she had yet to receive authorization. In 1938, Lucy Schildkret had studied in Vilna and worked at the YIVO. Prior to the war, she would return to the U.S. and work as assistant to the research director at the YIVO headquarters in New York. In 1946 she journeyed to Europe as an educational worker with the American Jewish Joint Distribution Committee (AJDC), the largest Jewish relief organization in America. Through this organization she was able to work with displaced persons in the camps. With her skills in Yiddish and time at YIVO, she was able to discern that books that had been labeled as unidentifiable were indeed identifiable. But even as she acquired the authority to help identify the YIVO library, she maintained her focus of serving the people housed in the displacement camps, and she would do so with a tenacity that would characterize her career for decades to come. Her memoir presents a powerful account of the emotions stirred by working with the contents of the library from a place that she had called home and knowing what had happened to the people she’d called friends as the Nazis destroyed the city. 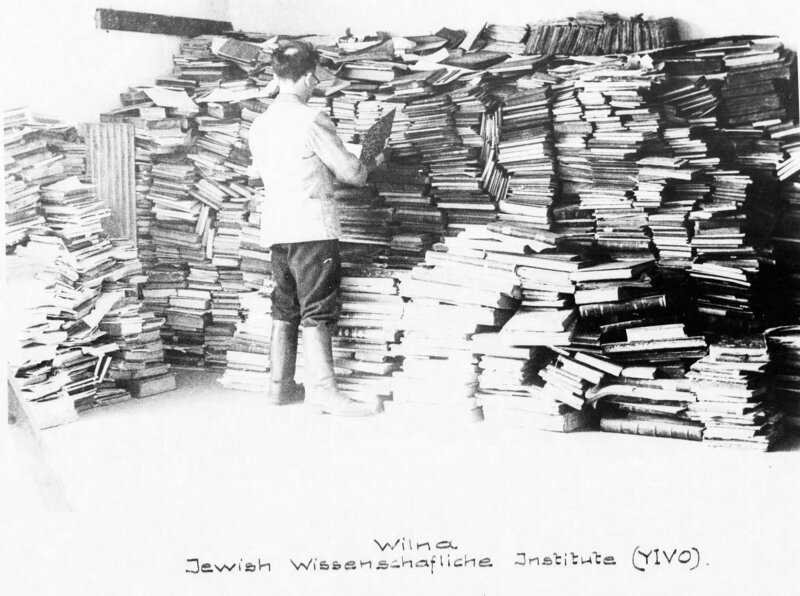 Eventually, with the combined effort of many individuals in several countries, over 90,000 items would be returned to the YIVO. Seymour Pomrenze who had been pivotal in streamlining systems at the depot would be brought back to help shepherd the return of these items. In 1998, Pomrenze shared his personal reminiscences of his experience with the Offenbach Archival Depot and the depot’s considerable achievements restituting and distributing millions of Nazi-looted materials including the YIVO library. Mr. Horne, the person with whom we are taking this walk through history, would wrap up his tenure at Offenbach in 1948 though files show that he continued to support depot activities until its closure. In the Cold War world, he would, strangely enough, continue to work with books and even return to his earlier interests in music and photography as he embarked upon a new journey. One world war had ended. A new type of world war had begun. A new weapon in that war was the exchange of culture and what better place to share all that made up culture — from art to music to literature — than in a library. Another super interesting post. I was a small child during those years. I heard about all those things, and worse other things, by hearing the adults in my family discuss the horrors of the Nazis. We were always very secure in the countryside, but apparently the distress and fear that was palpably in the air has left me with a heightened anxiety response for the rest of my long life. on April 20, 2015 at 10:45 | Reply mr. POP! This is so fascinating. Thank you for taking on this project, and best of luck as you seek to uncover more information.